First off, a gigantic thank you to Sodium Girl readers for passing on the link to Friday’s post. A big ‘ol check for $300 smackaroos is being sent off this afternoon to help recovery efforts in Haiti. And while I wish Ed Macmahon could be the one handing it over to the Red Cross, I think we can all be quite proud of participating in this necessary call-to-action. Now that our hearts are filled by good deeds, it is time to fill our tummies with good food. This rainy California weather demands something hearty and warm and this dish is appropriate and satisfying for breakfast, lunch, or dinner. On a drizzly day not too long ago, I whipped up this recipe for Baked Eggs over Roasted Tomato Sauce and Citrus Herb Couscous. It was inspired by both the recent food52 contest for best couscous recipes and the leftovers sitting in my refrigerator: a bowl of homemade roasted tomato soup from the night before, some wilting parsley, and a few eggs with nearing expiration dates. I find that the most enjoyable part of eating a fried egg is lapping up the yolk with something carby, preferably a freshly baked piece of bread or some crispy hash browns. But when I’m eating out, both the bread and the browns are out of the question due to baking powder/soda and salt. And at home, unless I have low sodium bread lying around, I am again out of luck and end up painting my fingers with the yolk just to savor every bite. This gets messy, though, and is often embarrassing around guests. So, for this recipe, which not only contains oozy egg but smoky tomato sauce, I knew I needed to find an easy, sodium free vehicle to transport the delicious mess to my mouth. I searched through the contents of my cupboard and came upon a cup of Israeli couscous, and with that, a new favorite was born. 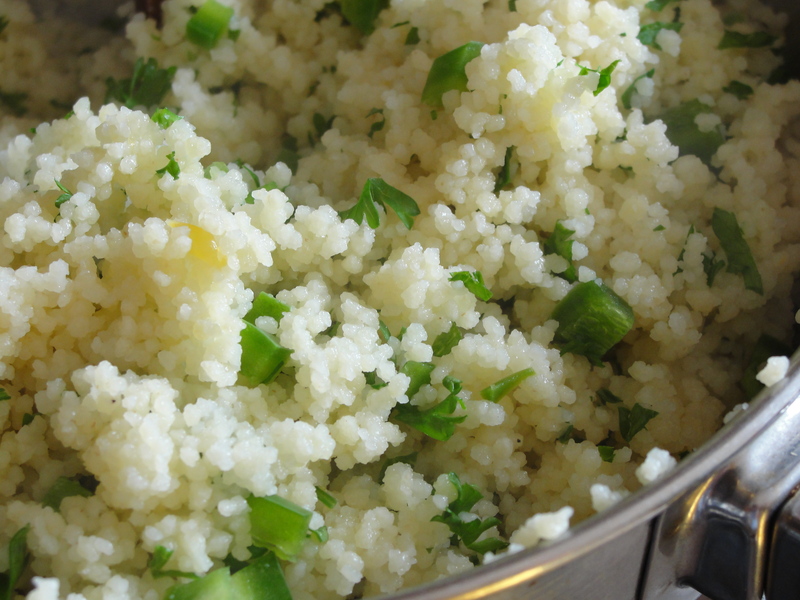 The citrus, herb couscous simultaneously enhances the flavor of the egg/sauce combination while ensuring a clean bowl. You will not believe how much punch this little dish packs and, since each baked egg is cooked in individual oven-safe pot, the presentation is pretty awesome too. If you are low on time, or patience, you can also use some low sodium tomato sauce (30 mg per serving). So today, stay warm, stay dry, and chow on. Happy MLK day. 1. To prepare the tomatoes and poblano pepper, first wash and then remove the stems. For the tomatillo, remove the outer leaves and rinse quickly under water. For the poblano, slice off the very top and make another slice down the side. This will give you access to the seeds which you can simply remove by hand. Place the tomatoes, tomatillos, and the poblano in an oven pan. 2. Turn on the oven broiler to low and place ingredients from step one on the top rack directly under the flame. Allow for them to char on one side for 5 minutes. Turn the tomatoes, tomatillos, and poblano two more times until all the sides have had a good amount of heat (a total time of 15 minutes). 3. Remove the tomatoes, tomatillos, and poblano and allow them to cool. 4. In a large pot, heat olive oil over medium flame and add the shallot and garlic. Allow the garlic to brown and shallot to become slightly transparent, stirring constantly. 5. Peel the charred skin from the tomatoes, tomatillos, and the poblano. An easy way to do this is to put them in a paper bag and rub. 6. Add the tomatoes, tomatillos, poblano, and the roasting juices to the pot. Blend in a blender or with an immersion blender until mostly smooth and allow it to reduce for another 15 minutes over medium heat. Add pepper to taste. 7. In another small pot, heat 1 cup of water and bring to a boil. 8. Add in the couscous and stir for 2 minutes. 9. Remove couscous from the flame and add juice from one small orange, the jalapeños, and the parsley. Mix well. 10. In two oven safe dishes, layer the couscous and roasted tomato/pepper sauce. Crack one egg in each dish and dust with chipotle powder. 11. Place the two dishes under the oven broiler on low for 5 to 10 minutes or until the white has hardened. 12. To serve, sprinkle leftover parsley on top and dig in. Can’t wait to try this! Nothing makes me happier that an egg over some carbs! wow this looks so amazing– i’ve had a moroccan — maybe lebanese? version of this with tomatoes, but yours looks much much tastier, duh. just ask my computer screen i’ve been awkwardly licking. 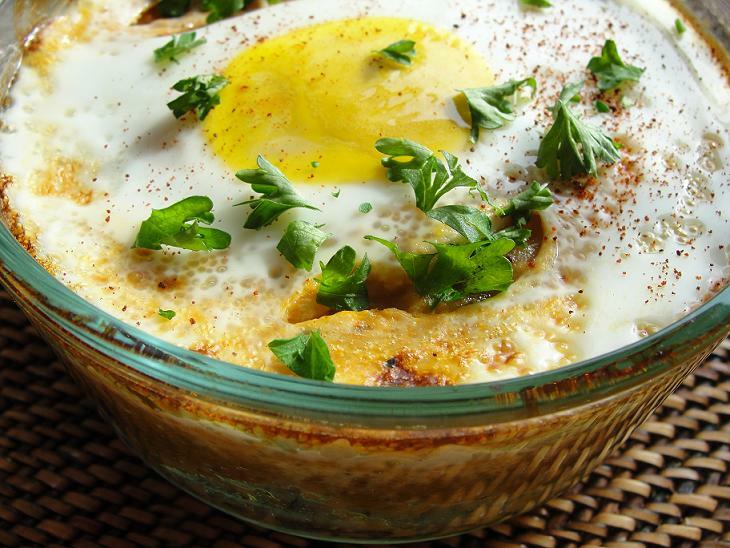 This looks really good…will definitely be trying couscous and eggs this weekend! Yum! Have fun and let me know if you make any personal additions to the recipe! Great post! Never thought of egg on couscous but it makes so much sense. Welcome to the blog and thank you! It was a moment of pure circumstance, but I am so glad I decided to plop that egg on top. It is now a go-to dish for me! Enjoy!